The Clare Chorale will be holding their 14th annual concert at Theatre at the Mill on Saturday May 27 at 7.45pm. The Clare Chorale is a popular mixed voice choir based in Ballyclare. The choir enjoys a busy diary of engagements throughout the season. It has singers from all professions who base themselves in Ballyclare, a town well known for its musical traditions. Regular singing throughout the province keeps them busy and they are always adding to their membership and repertoire. Their conductor is local Mezzo-Soprano, Sheelagh Greer and their accompanist is Darren Day, also a full-time musician. Last season they were delighted to be selected to take part in the BBC Songs of Praise. 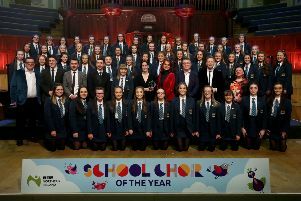 The choir will be joined on the night by guest performers, including singer Karl McGuckin, who recently took on the role of Jekyll and Hyde at the Grand Opera House with Belfast Operatic Company. For further information or to book tickets, priced £15, contact the Theatre at the Mill Box Office on 028 9034 0202. Alternatively, to book tickets online, log onto www.theatreatthemill.com. To find out more about the choir, log onto www.theclarechorale.com or find them on Facebook.